I’m Ioana, I’m 34 and I carry with me an old sin. When I was 21, I gave birth to a healthy and well-behaved little girl who was like an angel. Seven months later, I realized I was pregnant again. Everything crumbled around: what to do? Before giving birth to my daughter, I had worked without social security benefits. Now we lived with my in-laws and worked wherever we could find something to do. I wanted to study at the university but I could not afford to. We could barely make ends meet. 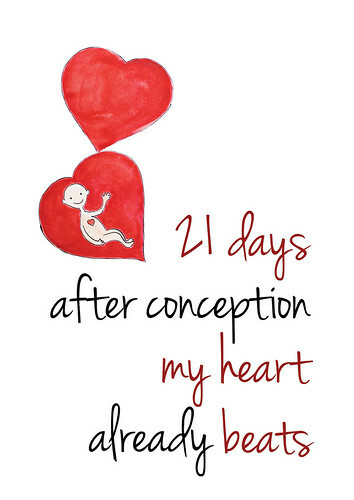 I took advice from my mother-in-law and decided to have an abortion. When she heard about that, my sister became inflamed and kept calling me a few times a days. I started ignoring her calls. She insisted I should not kill the baby, while I kept telling her she had no idea what she was saying. My mind was so obscured that I could find a host of “excuses”, of reasons to do it. I never thought about how I would be able to live with it afterwards, how I would be able to look myself in the mirror and so on. I shall never forget that huge ward full of pregnant women who wanted to become un-pregnant, who thought they did not need their children and killed them in worse conditions than when we kill animals, without even thinking it was a sin, like nothing, like everything was normal. I had a weird feeling, as if I knew I wasn’t doing the right thing. But then always came the thought: What to do with another child? I could barely raise one. I was the last that evening…. I left the hospital shattered and full of regret. And the thought that “I had no other way” kept nagging me. Time has passed, my family has fallen apart and my daughter has often asked me why she had no sister or brother of close age (she doesn’t have one at all). I look down and remain silent hardly able to restrain my tears. As years have passed, sorrow and regret for what I did have grown deeper. Life’s hardships have made me get closer to the Church, to God. I understood that everything happens for a reason in our own lives. The fact that I am alone today, with a child who doesn’t listen to me, and I have no idea where to go, is due to the fact that, when God gave me a second child, I threw it away, saying I did not need it. My mind was so obscured and now I am struggling to get to light, praying for forgiveness. I kindly ask you all who read this to never have an abortion, to never agree to it, because it will only bring you sorrow and regret. Everything can be repaired by prayer and patience, but abortion cannot be made right again. Abortion is not a solution, it’s just the tool through which the Devil subdues us and makes us his slaves, keeping us away from God. I could add volumes on the topic, but the essence is: never accept abortion, there are families who cannot have children and wish with all their heart to adopt at least one. Look for advice from one of our church spiritual advisers when you find yourselves with a child you were not expecting. You should not accept killing your child under any circumstances: words fail me as I am trying to describe the regret and suffering of a mother’s soul after she went through something like that!